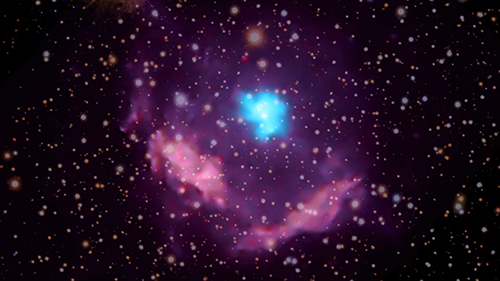 X-ray data from Chandra are helping address some of those questions. A team of astronomers has confirmed that the supernova remnant Kes 75, located about 19,000 light years from Earth, contains the youngest known pulsar in the Milky Way galaxy. The rapid rotation and strong magnetic field of the pulsar have generated a wind of energetic matter and antimatter particles that flow away from the pulsar at near the speed of light. This pulsar wind has created a large, magnetized bubble of high-energy particles called a pulsar wind nebula. Between 2000 and 2016, the Chandra observations reveal that the outer edge of the pulsar wind nebula is expanding at a remarkable 1 million meters per second, or over 2 million miles per hour. Since scientists discovered pulsars in the 1960s, they have identified over 2,000 of these rapidly spinning, dense stellar cores. New data from NASA's Chandra X-ray Observatory have led to astronomers to the youngest known pulsar in the Milky Way galaxy. Kes 75 is the expanding debris field of an exploded star located about 19,000 light years from Earth. In the center of Kes 75, a bubble of high-energy particles is moving outward at a remarkable speed of over 2 million miles per hour. 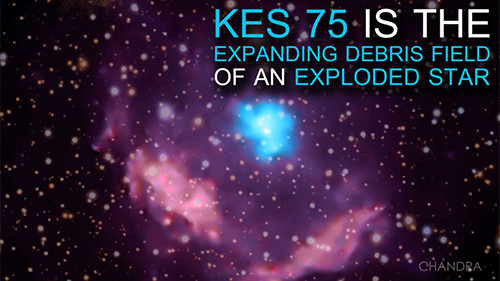 Information about Kes 75 from Chandra and other telescopes is helping astronomers get insight into the exploded star and its environment.